Tottenham Hotspur Interested In A £35m Move For This West Ham Midfielder: Should Pochettino Sign Him? According to the latest reports from the Daily Express, Tottenham Hotspur are plotting a £35m raid for West Ham United’s star midfielder Declan Rice. The report also adds that Liverpool are also in the mix to land this 20-year-old midfielder who has caught the eye for the Hammers this season. Rice has been linked with plenty of English heavyweights in the past few months, and this is not the first time that Tottenham’s name has been mentioned with him on the papers. However, it remains to be seen whether the Irish midfielder would look to jump ships in the summer having signed a new contract back in December last year. His current contract will keep him at the London Stadium up until 2024 so we don’t expect the Hammers to let their prime midfielder leave for cheap. The Irish midfielder showed his class in their recent match against Liverpool where the Hammers held the Merseyside outfit to a draw (or many would believe that it was Liverpool who held West Ham to a draw that day). Rice was the best midfielder on the pitch as he never gave the Liverpool attackers too much breathing space in the final third and he was always on their back and made some crucial blocks and interceptions during the game. Moreover, he showed great composure on the ball and set up play to launch some good counter attacks. Rice is not even a defensive midfielder by trade as he has mostly played as a centre back all throughout his career, but it has never looked like the 20-year-old is playing out of position as a defensive midfielder. The Irishman is definitely one for the future but it would be tough for the Hammers to keep hold of him when top clubs come vying for his signature. Spurs have now gone over a year without making a signing, but they are doing a fantastic job in the Premier League by giving the likes of Manchester City and Liverpool a run for their money in the title race. Spurs lost the services of Mousa Dembele in January, and we can expect some business to be done by the club in the upcoming summer. The North London outfit can be an excellent fit for someone like Rice as we have seen how the likes of Harry Winks, Dele Alli and Eric Dier have thrived under Mauricio Pochettino. However, it remains to be seen whether the East London outfit would let him leave after just striking a long term deal with him not too long ago. Spurs though should try their luck in the summer to check Pellegrini’s resolve. Manchester City Hoping To Sign This West Ham United Defender: What Will He Add To Guardiola’s Side? Crystal Palace Interested In Exciting West Ham United Defender: Where Can He Fit Into Hodgson’s Plans? 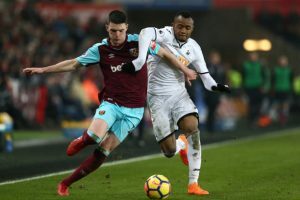 West Ham Refuse to Rule Out Sale Of English Midfielder Amidst Liverpool Interest: Big Boost For Klopp? 3 Alternatives For 25 Y/O Brentford Defensive Ace At Leeds United Including This Sunderland Star! Bournemouth Ready To Move In For Sensational English Defender: Right Fit For The Cherries?